Pinterest...the anti-housework tool. It's one of those things that I say "I'll just be on for 10 minutes and before you know it, the day is gone and I'm craving avocado fries after pinning so many food items. I love it, though! If you are not on Pinterest and need an invitation, leave your email address in a comment below or email me at va_voomvintage@yahoo.com and I will send you an invite right away...and then we can be unproductive together! 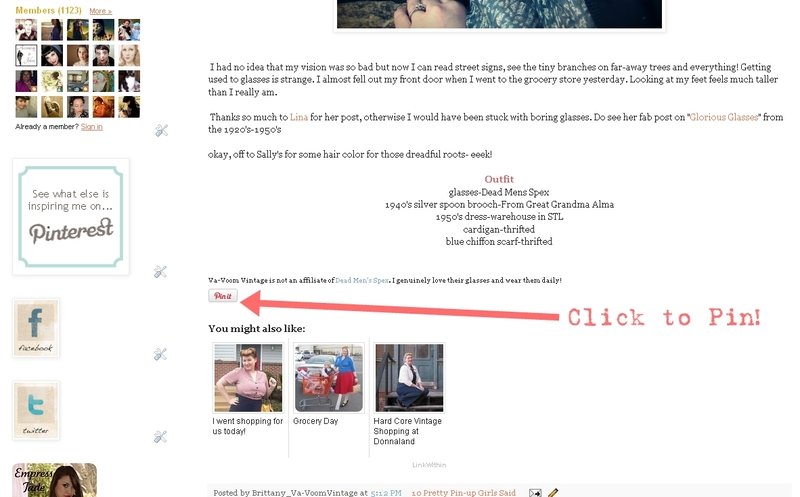 This morning, I added a "pin it" button for pinterest to all of my blog posts so if you see something you want to save for inspiration later, you can click the button below the post and stick it on your pin board. Voila! I used this simple tutorial for how to add a pin button to your blog posts. It only took about 3 minutes and was very straight-forward. oh heck that is a sucker of time! I have joined but I'm avoiding it right now as I know I'll just spend hours filling my folders!! 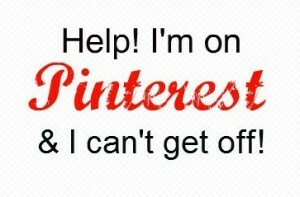 I also have not gotten to into "pinning" since I can already destroy a day quite handily just with blogs and youtube. I'm just so interested in every vintage beauty tutorial I find, and next thing you know, I've spent two hours watching videos. I'd start murdering evenings too with one more thing keeping me in my chair, lol. yea, someone new to follow. It is so addictive! I look the other day and was amazed/slightly horified that I have 50 boards and over 2k pins!! (and I have only actually finidhed 2-3 of the projects I have pinned so far). I am so NOT going there girlfriend! I spend way too time on this contraption without adding Pinterest...no matter how alluring it looks! Once you pin you can't stop! I did a post about this last week :( I'm now following you. I am a total pinterest addict now, too. Help! I think Pinterest is excellent. I like to source the pictures in my blog and Pinterest makes that easy. And I can "store" pictures for later use. Thank you for the link to the tutorial- I have been wondering how to do that!